This week, Alpher discusses Netanyahu's meetings this week with Hollande, Putin, and Kerry to discuss the prospective Iran nuclear agreement, a possible revival of the French-Israeli alliance of the 1950s and 60s, how Netanyahu could allow tenders for planning 24,000 additional settlement units to be published last week, considering how sensitive the current juncture is for Israel's international relations, and whether there was something unique or particularly worrisome about the latest "price tag" attack launched against Palestinians by extremist settlers in the West Bank. Continue reading Price Tags Escalating? Bibi and the tenders, and more: Hard Questions, Tough Answers with Yossi Alpher: November 18, 2013. Continue reading Ad hoc alliances on Iran, Lieberman returns, and more - Hard Questions, Tough Answers with Yossi Alpher: November 11, 2013. Alpher discusses the significance of the Levy committee report, the fate of Olmert in politics, and the possibility of a near-term Israeli military strike against Iran. Continue reading Hard Questions, Tough Answers with Yossi Alpher - July 16, 2012. As the Master of Ceremonies at Jerusalem's Mount Herzl announced the end of Yom HaZikaron, Israel's solemn Memorial Day, and ushered in Yom Ha'Atzma'ut, Independence Day, millions of Israelis, having just ended a day of remembrance and mourning for the fallen, are sweeping the streets to celebrate their country's 64th birthday. Continue reading When She's Sixty-four?. The Newsletter includes a photo gallery of APN and Peace Now activities, events and guest speakers, "News Shorts" and a special interview. Continue reading APN Newsletter - Spring 2010. Continue reading Spring - 2009. Continue reading APN Newsletter - Spring 2008. Continue reading APN Newsletter - Fall 2007. 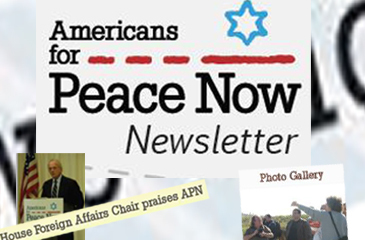 The newly designed APN Newsletter includes a special section "Perspectives on the 40th Anniversary of the Six Day War"